Parasaurolophus is classified as a Hadrosaur (duck-billed dinosaur). Included in this family is also the Iguanodon and Corythosaurus. 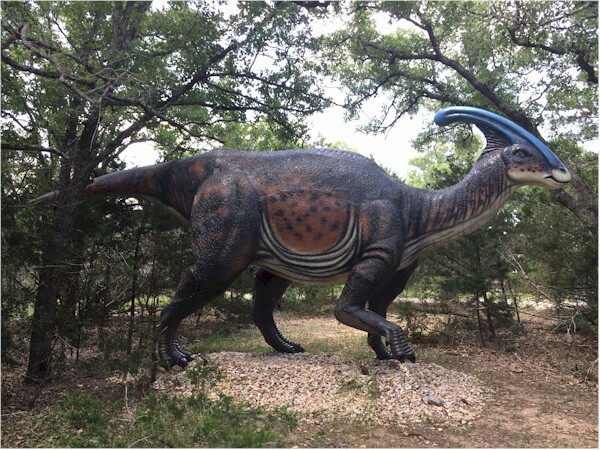 Parasaurolophus is best known for the large, backward-curving crest on its head. The crest was hollow and widely believed to be an instrument of communication in which the dinosaur could use to produce a loud bellowing sound. The crest is also believed to be used as a way to regulate body temperature by collecting the heat during the day, then slowly dissipating it at dark. Parasaurolophus probably spent most of its time browsing for vegetation on all four legs, but could stand and run on its hind legs at a decent speed for a short period of time. Parasaurolophus was primarily a land dweller, but was also believed to be semi-aquatic.